A wealthy industrialist discovers his wife is having an affair and decides to exact revenge by blackmailing her under an assumed identity. Conspiracy thriller inspired by the conspiracy theories surrounding the assassination of JFK. After a fictional president is assassinated, a determined, tough prosecutor investigates the emerging conspiracy behind it. A woman and her pimp exploit a painter for money. 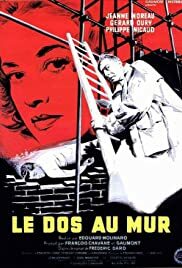 Released at the same time as "ascenseur pour l'échafaud" ,both featuring the same actress (Jeanne Moreau),but unlike Louis Malle's work,not labelled "nouvelle vague" "le dos au mur" has enough assets to catch the viewer's attention:outside Moreau,a screenplay adapted from a Frederic Dard 's Novel,with an action packed ending,and the desperate mood we find in every Dard-inspired film noir :such Moreau lines as "I could not live without him anymore,but I could not stand life without him "is the hero's only solace before his fate is sealed. Gerard Oury who would direct such French blockbusters as "le corniaud" (1964) and "la grande vadrouille" (1966) is not much of an actor and his part should have been given to Robert Hossein,the par excellence Dard actor.Besides ,the screenplay which uses the long flashback one more time(one too many) laboriously progresses in the first half,with a much too slow pace.Worth a try all the same.